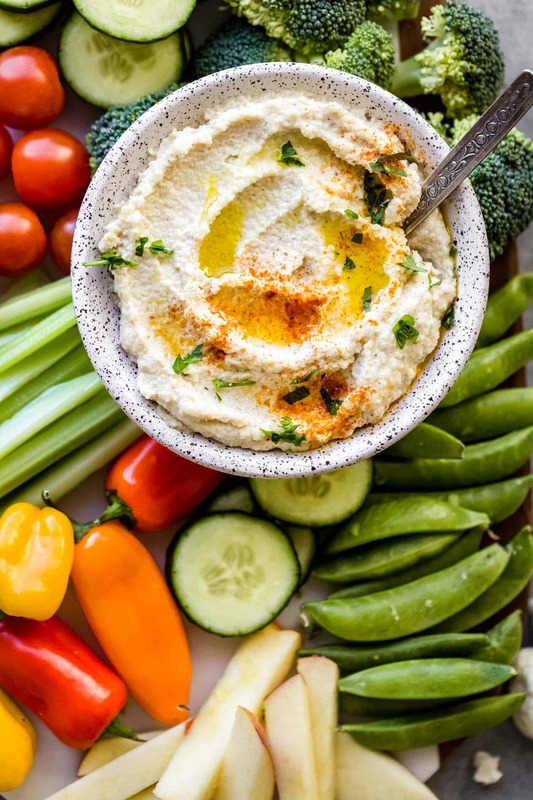 This low carb cauliflower hummus is a really delicious chickpea free version of hummus that’s absolutely dairy free, paleo, Whole30 friendly and can be made vegan! 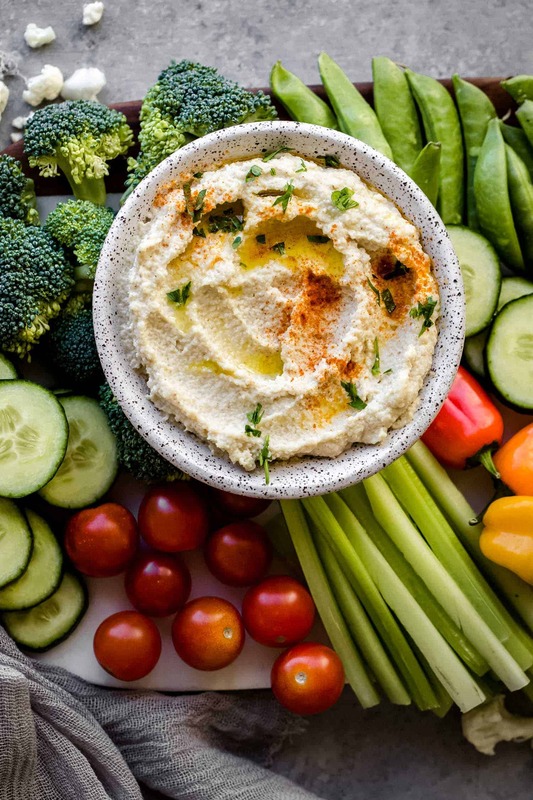 It’s creamy, nutrient dense, and I’m sure you’ll love it just as much (if not more) than traditional hummus. Do I need to roast cauliflower for this cauliflower hummus to turn out? I am going to have to say absolutely. Roasting vegetables brings out a very particular flavor and texture that consuming them raw simply would not. 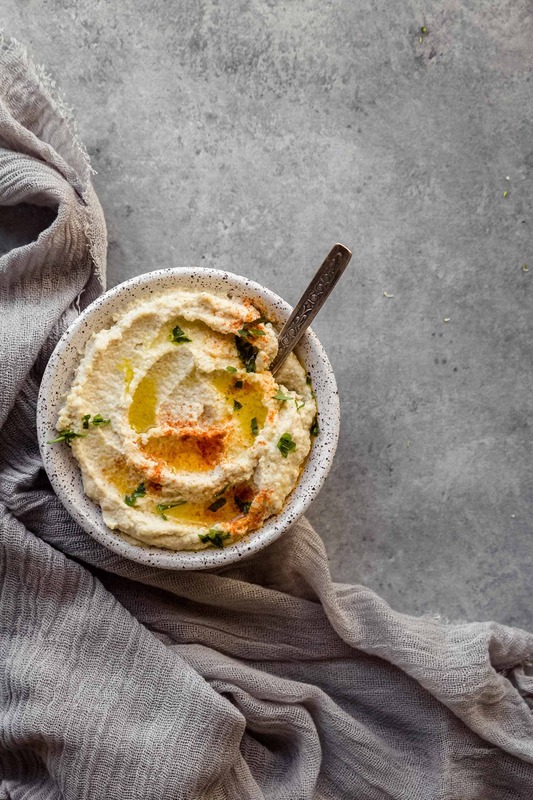 I have not even tried making this hummus with raw cauliflower, but I think it’s fairly safe to assume that it would not be as creamy or flavorful. It may end up not looking or tasting like hummus at all. You can even prep and roast the cauliflower the night before and store it in the refrigerator. The next day, all you’ll need to do is pull it out to bring it to room temperature and combine everything in the food processor. It will all come together so quickly that way, and you can make it fresh the day of a planned get together or if you’re bringing it to an event or potluck! I’m really very excited that I’ve got this recipe for you all. I’ve been eating hummus for years, and I have to say that it doesn’t always agree with me. I’m not always dealing with some sort of negative reaction to chickpeas, but there are days that they leave me feeling bloated or a bit sluggish. I realize that not all chickpeas are created equal, and I don’t have a reaction to every type of hummus that I try. However, it will be really wonderful to now have an option for a chickpea-free hummus. It’s just as good (if not better) than the real deal! 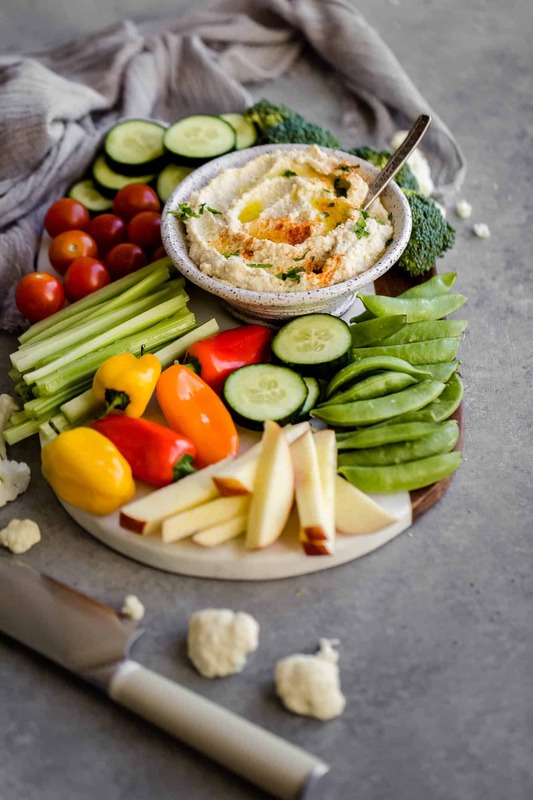 Can I make this cauliflower hummus vegan? You sure can. I like to add bone broth to this recipe, as it boosts the nutritional content! 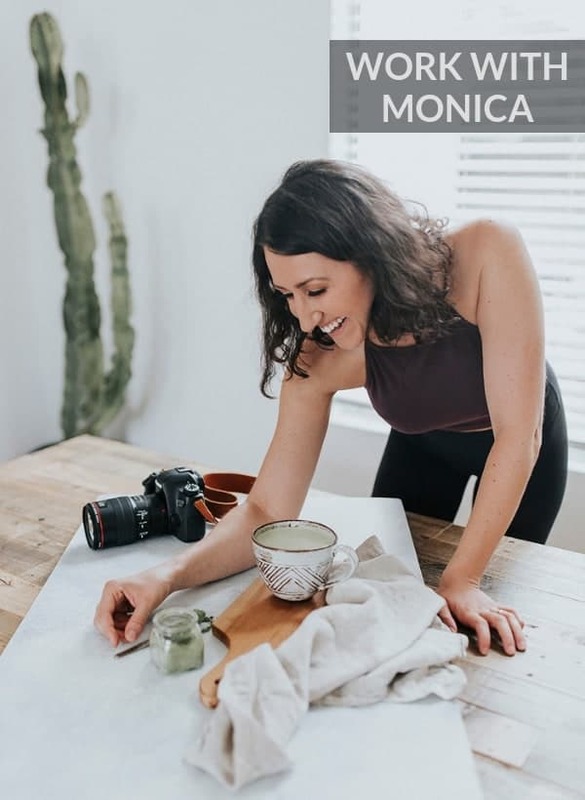 However, if you want to make this recipe vegan or simply do not have access to bone broth, omit this ingredient and extra oil. I’ve provided you with instructions on how to do this in the notes section. You may need to add a little bit of water as well, depending on the thickness and texture of your hummus. If you don’t want to use extra oil, you can also add in vegetable broth in place of the bone broth. Be sure to get a low sodium broth, as you don’t want to end up with something overly salty as the finished product! I’ve had cauliflower hummus both with and without the bone broth addition, and you just can’t go wrong! First, preheat the oven to 400 degrees Fahrenheit and adjust the oven rack to the middle position. Line a baking sheet with parchment paper and set aside. In a large bowl, combine cauliflower florets with 2 tablespoons of oil. Mix well with a spoon or your hands, making sure all of the cauliflower is well coated. Transfer to the baking sheet and spread out in a single layer. Bake at 400 degrees for roughly 20 minutes, flipping halfway through. Cook until they begin to turn brown around the edges. Remove from the oven and set aside to cool. In the bowl of a food processor, add garlic cloves. Pulse a few times until the cloves have been minced. Add cauliflower florets, tahini, spices and bone broth. Pulse on high for about 1 minute until the florets have been completely pulverized. Turn the food processor on high but leave it open at the top. VERY SLOWLY pour in the oil. Once it has all been incorporated, turn the food processor on low and add lemon juice. Taste for additional seasoning. You want the hummus to be thick & creamy. If it’s too gritty or dry, be sure to add another tablespoon of oil. If you’d like it even thinner, you can add a tablespoon or two of water as well. 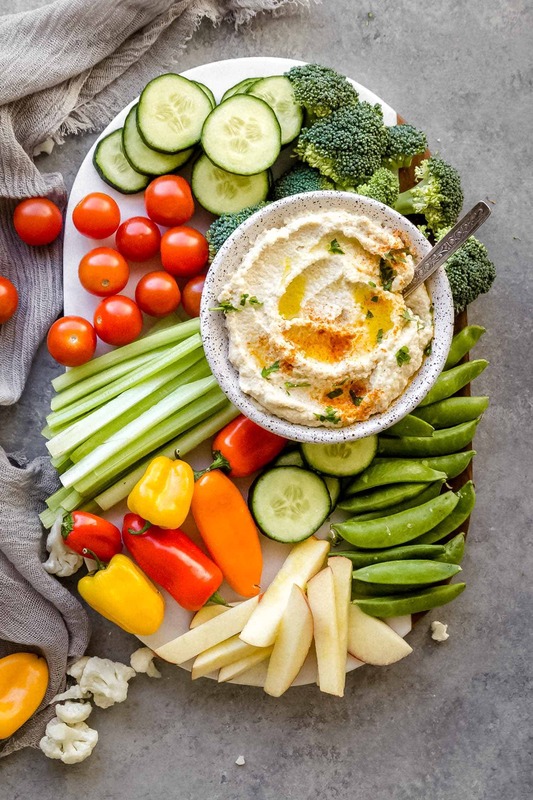 To keep this recipe Whole30 compliant, serve the cauliflower hummus with slices of vegetables instead of crackers or chips. 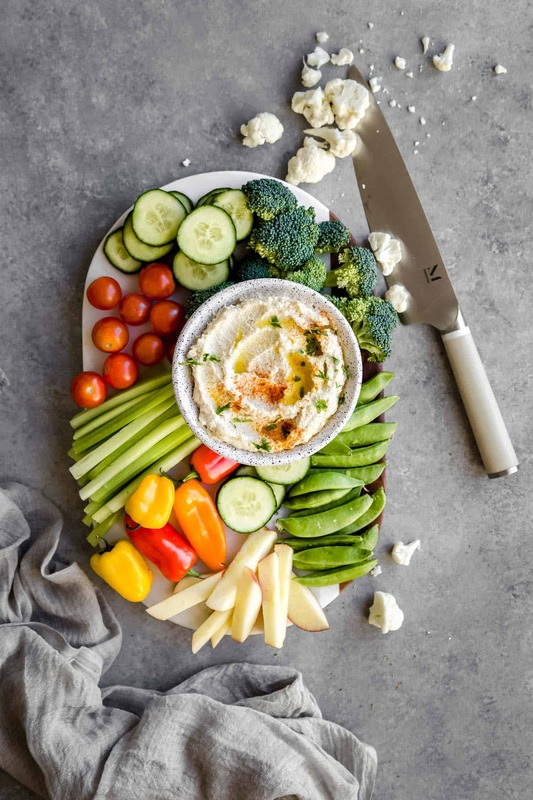 This low carb cauliflower hummus is a really delicious chickpea free version of hummus that's absolutely dairy free, paleo, Whole30 friendly and can be made vegan! It's creamy, nutrient dense, and I'm sure you'll love it just as much (if not more) than traditional hummus. If you would like to mke this recipe vegan or do not have access to bone broth, simply add more oil in its place. I would start by adding an extra tablespoon at a time and just want the texture. You want the hummus to be thick but creamy. Taste and adjust accordingly! You will want to use lemon juice from fresh lemons. Bottled lemon juice can sometimes give off an unpleasant aftertaste in this recipe. Preheat the oven to 400 degrees Fahrenheit and adjust the oven rack to the middle position. Line a baking sheet with parchment paper and set aside. In a large bowl, combine cauliflower florets with 2 tablespoons of oil. Mix well with a spoon or your hands, making sure all of the cauliflower is well coated. Transfer to the baking sheet and spread out in a single layer. Bake at 400 degrees for roughly 20 minutes, flipping halfway through. Cook until they begin to turn brown around the edges. Remove from the oven and set aside to cool. In the bowl of a food processor, add garlic cloves. Pulse a few times until the cloves have been minced. Add room temperature cauliflower florets, tahini, spices and bone broth. Pulse on high for about 1 minute until the florets have been completely pulverized and you are left with a thick and clumpy mixture. Turn the food processor on high but leave it open at the top. VERY SLOWLY pour in the oil, just a teaspoon or so at a time. Once it has all been incorporated, turn the food processor on low and add the lemon juice. Taste for additional seasoning. 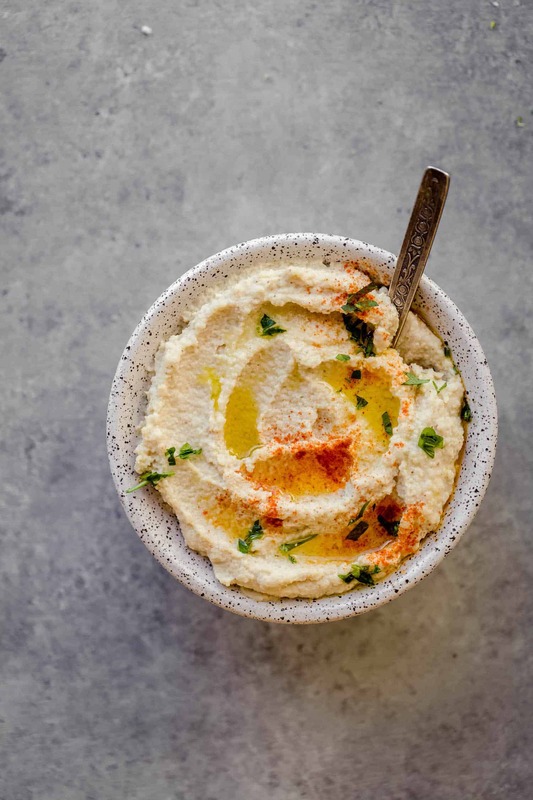 You want the hummus to be thick and creamy. If it's too gritty or dry, be sure to add another tablespoon of oil. If you'd like it even thinner, you can add a tablespoon or two of water as well. Store in an airtight container in the refrigerator. It will keep for up to 3 days if you have used frozen bone broth. Otherwise, it will be good for about a week!